I kinda agree with you, but I think you make it sound more difficult than it actually was. A sand desert is something which really can't be compared with early-modern European campaigns and I agree that it doesn't say that Chinese logistics was better. Europeans just didn't have those deserts. But Kaghan specifically talks about surviving in steppes. And many nomads throughout centuries often had quite large armies despite the fact that they lived only in steppes. 1. Qing didn't really do anything new here. You are making it sound like trade was not achieved on those vast and barren lands before the Qing, but in reality those places saw the Silkroad trade. What the Qing did was the same trade. They just bought more goods than before in history, but from what Perdue writes it seems that even those relatively small campaigns costed too much money in the eyes of Chinese government. Despite the fact that it was a powerful empire which didn't wage many wars. In the 2nd campaign, the Qing tried to avoid shipping new supplies to the frontline. And Perdue makes it sound like 3,800 carts is some proof of huge logistics. But in Poland, 1,000-3,000 soldiers would have this number of carts in the army. 2. In places where the Qing armies were located they had some local ressources as well. They were buying horses from Mongols and there were actual towns in those "barren" steppes. 3. Perdue writes that supplies had to be transported for 30 days and the price of transport was 10 times larger than the price of grain. In Europe, grain was also sometimes bought by the consumer for the price 10 or more times higher than the price for which the producer sold it. And as I wrote above, 30 days is the time it sometimes took to bring food to Poles besieging Psków when it had to be transported through enemy land in winter. And that's not neccessarily one of the most extreme cases. 4. 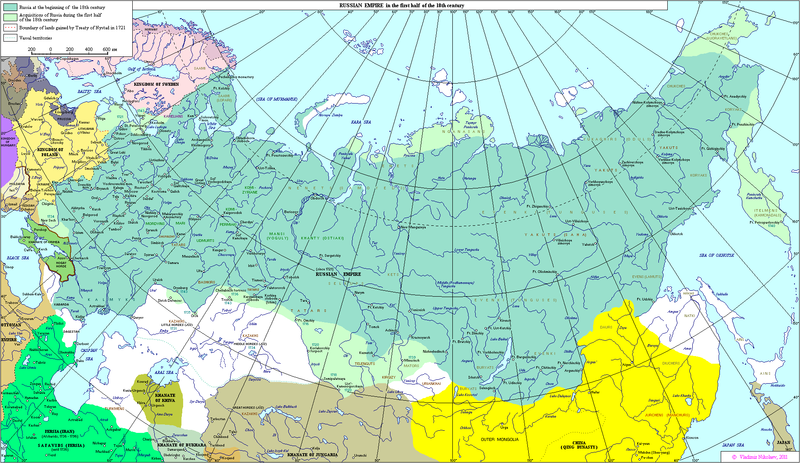 Most of Russian territory was insufficient for armies and Russia still held large armies on steppes. Even when we talk just about the Perekop campaigns, when Russians and Cossacks retreated from enemy land, they still stayed in steppes. It was normal for them to quarter in such terrain. 1. Armies were too large for local supplies to give them most of the food they needed. 2. Pillage was minimal and wasn't an important source of supply. Though taxes were very high and you can make an argument that those taxes were just legalized pillage. But if so, then the borderline between pillage and non-pillage is fuzzy and you could just say that the Qing used legalized pillage on its subjects as well. I'm guessing the Chinese taxes weren't as high, since they didn't wage really expensive wars. Furthermore, saying that supplies shipped to places like Hami or Barkul were not local supplies is a bit of an overstatement. Armies which stationed in those places used mostly supplies from areas through which those armies marched before they got to the frontline. If they had enough wagons for 4-6 months of supplies, they would just take those local supplies while marching through those areas. This is what was often done in the east of Europe. So technically one of those methods uses a system of convoys and magazines while the other method uses local supplies, but the effect is the same. I've listed plenty of facts, just because you choose to ignore them or simply cannot comprehend them does not make them invalid. Reading other's posts right is itself a sign of respect, and you have none of it. I am not insulting you either, I also truly believe from your multiple responses (even now) that you have no idea what Perdue was arguing or have a basic grasp of geography and the workings of logistics and it is getting tedious. I ask again, where did I change any part of my original argument? I've cited all the sources, primary and scholarly in verbatim that defended my argument, whereas you have nothing but wikipedia and your own opinion. I'm truly not sure if you are just purposely ignoring them or simply isn't capable of comprehending scholarly articles. No, I get angry when you claim something to be wrong and insist on it when you've provided no valid evidence to refute it, and then accuse me of misinterpreting articles when its clearly you who did not have a solid grasp of the subject or what the author argued. I think the quotes are pretty self evident, and others here understand them perfectly. I asked you to quote where I distorted Perdue because you claimed I did. When challenged just where you couldn't provide the quote and evidence, that is trolling. Asking a moderator to step in and handle this is the easiest method, because if I don't the conversation will just go in circles, and I certainly have no time or patience for that. Don't talk the talk and not walk the walk. It's not much to ask. If you have so much time to waste in complaining about my pressure, then just quote where I distorted Perdue and prove yourself right, instead of wasting more of everyone's time in continuing this meaningless bickering. All I see right now, is a person who made a claim and cannot back it up. 1) No they didn't, they stayed in Zungharia, I already posted the contemporary source in Sheng Wuji to prove that, your unfamiliarity with the geographical names of the region mentioned in the quoted source is why your arguments only have comical values. 3) It's in hostile territory and the logistics was provided by people from Gansu not from the locals, which is the main point. 4) They left 30,000, more than half of the army, that is hardly a skeleton army. As showed in my sources, the Qing stayed near Ili 1,000 KM from Hami for over 2 years, what is wrong with that claim? Except Davies explicitly stated that the 20,000 were "slave retainers, carters, and sappers marching in the army's train", so they are not fighting soldiers. Even if we assume all the Cossacks were fighting soldiers, lets not forget the campaign never went beyond 100 KM nor reached its destination, so its hardly meaningful compared to an army that marched over 13 times its distance. You make a lot of assumptions on where the Russians marched, please cite an actual source. Samara is on the northern edge of the steppe zone, this is basic Russian geography. Davies clearly used it as the starting point into empty steppe, and did not mention that they are only marching on enemy steppe. Besides even if you only want to include enemy barren zone, the distance north of Zamiin Uud is already enemy steppe territory and the Qing still had to march some 800 KM, 4 times further than what the Russians marched. The point being they never successfully marched even 300 km into the steppe (or barren enemy territory if you want to use that as a dividing line instead), and both of these campaigns demonstrated that. In comparison Kangxi succeeded in feeding his army over 1,300 km into steppe territory (and still 800 KM into enemy barren territory) with a comparable sized army. There is little discrepancy here who marched more distance. Before claiming what is or is not an over-interpretation, you should cite a source what the exact distance Golitsyn marched was; no assumptions from you, I want an explicit source quoted in verbatim, with the page number cited. What other armies? I do not see it in Davies book. Cite it. I didn't say the Qing send one route, I said it could send over 100,000 army over 1,300 KM into the steppe in roughly the same time period too, dividing it was simply a more efficient method and I'm still waiting for you to cite a source where the Russians could do the same. The Qing conquered the Khalkh in Mongolia afterall, the contemporary Russians didn't conquer the Crimean tartars (and it was much smaller in territory to the Khalkh in Mongolia). Are you seriously telling me that the Qing conquering a largely barren territory of 600,000 sq miles whereas the Russians failing to conquer a territory several times smaller does not matter? The logistical difficulties involved in the former is magnitudes more overwhelming. Marching into land with no intense resistance is missing the point Perdue was making. Settling down is not a military campaign. Except the Galdan campaign of 1696 already had as many soldiers and it marched further, accomplishing its political objective. The Zunghar campaign had 30,000-50,000, its merely around 2-3 times smaller than the Perekop campaigns, but it lasted over 2 years. Siberian campaigns involve a few hundred to a thousand settlers for the most part and they moved extremely slowly. The Qing Empire under Qianlong was around 5.3 million sq miles, the contemporary Russian Empire is at most a few hundred sq miles larger, and much of it is not even settled. The Qing conquered all of it in just a century; the Russians took over two centuries when it started marching east in the 16th century (that's not even including the Russian polity that existed way before that). There is not much point in talking about the mild difference in area but plenty about the speed and resistance involved in such conquests. 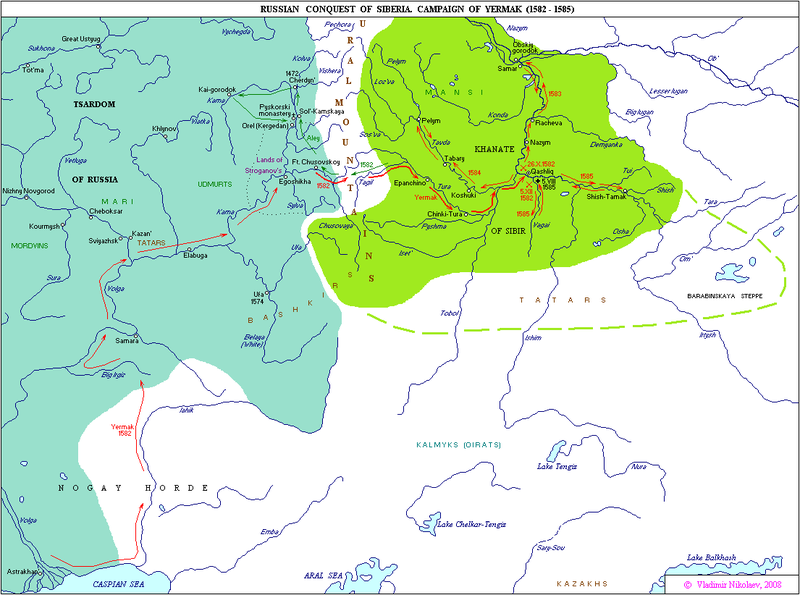 If you actually understand what Perdue argued, then you should be aware that one of the main point is that the Qing army didn't force contributions, and if you insist it did, you'll need to provide the evidence (conquest of the Tarim and slaughter of the Zunghars after they were already subjugated is not forcing contribution) where the Qing army did that. Don't give me vague explanations, you know full well that Perdue provided the exact marching distance and context and I expect the same from you if you want to refute his source. Also, please cite the source in verbatim, I'm not exactly keen in trusting your interpretation of them, especially after our last few unproductive exchanges. Suddenly what? That was what I argued since the beginning and what Perdue's article was about. Are you telling me you didn't catch that even now? But why doesn't that surprise me? Read Perdue again, because you clearly didn't catch the fact that he was making multiple points. Don't shift grounds. You claimed I misinterpreted Perdue, are you going to take that back and admit you were wrong or are you going to show me where exactly did I misinterpret him? I am talking about enemy land, not barren land (because you first mentioned that European armies didn't need contribution in their own land, and that the Qing was no different and would need contribution in enemy land too, a fact you still haven't demonstrated), because the Europeans used in the comparison are not marching in barren land, it should be self evident. The comparison with Russia was a different topic purely in regard to campaign in barren land, and has nothing to do with the topic on forced contributions. The entire argument was to show that the Qing army can campaign in land without exploiting local resources (that is forcing contributions or the land is just empty). Therefore, campaigning in both steppe and enemy land shows that. If you have not caught this, then you did not understand what Perdue was arguing. Yes, because all lands west of Hami isn't friendly territory, and neither is the land north of the Gobi when Kangxi marched against Galdan. The Qing marched them, yes or no? If you accept that, then the Qing marched in enemy territory. I don't know what part of this simple point is so difficult to understand for you. The point of the passage was to show transporting supply personnel isn't a feat. 20,000 of 50,000 came back, that is not most of them. Who said its friendly territory? The Zunghars rebellion didn't end until the beginning of 1758, the Qing was constantly in hostile steppe territory from March of 1757 to 1758, a period of one year. Ili is in enemy territory. The Qing army was surrounded by resistant groups. Even crushing Amursana himself required 7 months. Stop mentioning armies campaigning in areas that are not settled agricultural territory, they are not comparable campaigns. "So the campaign of 1755 is the only one where the Qing supposedly survived in enemy area without any local supplies for a year or longer, and I showed that they didn't." Sedentary city states are enemy territory (or are you confusing yourself that steppe and sedentary has nothing to do with enemy or friendly territory)? Second, you didn't show anything. I showed that the Qing did in fact campaign even in Zunghar territory for one whole year, through the winter too, so you were wrong when you claimed the Qing couldn't conduct a winter war. No, they spend a year. Seven months destroying Amursana's rebellion alone and 4 months to mop up the remainder resistance. I suspect that you are misinterpreting the word "rebellion" as if its Qing territory. It's not, when Amursana "rebelled", there was no Qing army stationed in the area, the entire Zunghar state was resisting and the Qing had to move a new army there. A word of advice, if you are not familiar with the topic, do not challenge what professional historians on the subject (in this case Perdue) argued in their passages. Dangerous or not, the Qing was still in hostile enemy territory. Their logistics did not depend on local resources. That was the point. The point isn't what degree of resistance the Qing army faced, its how long they campaigned in territory where they had little local resources to draw upon. This has been Perdue's entire point and the conversation did not need to drag out this long if you understood it from the start. Raziel, do you even read the sources you bring up yourself? On arriving at Smolensk the army would in fact ﬁnd most area foodstuffs already gathered up by the Poles for storage inside Smolensk, the residue to be had only at astronomical prices; purchasing would therefore be abandoned for exactions remunerated at below market price. These forced deliveries were organized by assigning particular villages to provision particular regiments. So no, the Russians did not buy everything at market price in that campaign, they forced contributions. Show me which foreign campaign did the Russians depend purely on interior convoys or buying things at market price and not force contributions on populations at values below market price. Don't compare settlements spread out over a century to one time military campaigns. Furthermore, do not use simplistic maps online. Much of the land in Inner Monglia are mixed desert-steppe lands, which are not included as "steppe land" in these maps. The vast majority of the land north of the Great wall were not settled agricultural lands, not just steppe, but mountains and desert. Marching over them takes even more effort than steppe. There are no cities between Beijing and the Gobi, and the Qing army started out from Beijing, the Russian Perekop campaigns started out in fortresses already built in the area. Furthermore, I've demonstrated even in regard to enemy barren land, the Qing still marched much further. Having convoys established in enemy territory is not your own territory, and the point is again that the Qing army did not have to exploit local resources. Show me where these armies didn't need contribution. Cite the source. No its not wrong, because it doesn't change the fact that the Qing campaigned in winter, which you argued they couldn't, so you are the one who was wrong. Even now you are not humble enough to simply admit this blatant mistake of yours. 1) Perdue never said the Qing can't campaign in winter, in contrast, he repeatedly emphasized that. It is you who said the Qing couldn't, so you were wrong. You said this: "The reality of the Chinese steppe wars is far from the idealized picture you paint for us. It seems that Qing did not even have the ability to wage a war in the winter. Comparing what I know about the Qing campaign and what I know about Russian campaigns, I state that the Russian army has reached a higher level of logistics and has developed faster. " Perdue merely mentioned one case where the Qing had to withdraw in winter, you interpreted that as the Qing can't campaign in winter period, ignoring the context behind every campaign being different. Again, by your logic the Germans in WW2 cannot campaign in winter, which is ludicrous. If this is the way you interpret sources, I worry about the validity of the rest of them when you do not cite direct passages. 2) If you are not going to give a context or sources, don't use it as an example. Well let me show you where I didn't in fact distory Perdue, and how you are distorting him all over. First of all, your random quote does not show me distorting Perdue. You said I misunderstood him. I didn't. You are the one who misinterpreted him in saying that the Qing can't campaign in winter. Perdue argued the opposite. You thought the Qing army returned in 1755 while on campaign, especially in winter, a baseless speculation that is now proven wrong. Second of all, the reason I showed the quote is pretty clear. The Russians showed "no concern about sparing the civilian population the burdens of provisioning or with giving it regular relief." The Smolensk campaign in fact showed just that, the Russians had to force contributions on populations at below market price. The fact that you used this campaign to "disprove me" shows to me that you just don't understand what Perdue or the other historians you cite on European warfare is arguing. You are asking this question because you didn't understand Perdue's point, because he already answered that and I will highlight the answer below. The Qing didn't burden the local population and Perdue wasn't just talking about Gansu here, he was talking about the sparsely settled nomadic regions too. I've even seen a decree from 1793 Nepalese campaign recorded in the Qingding Balebu Jilue where the Qing gave a similar order asking to buy things in Tibet at market price. Also, understand that Xinjiang, Tibet and Mongolia, even after conquered was still outer imperium and not a part of the central bureaucracy. So do not compare them to what European states did on their own national territory, compare them to what they did in conquered foreign territory. You have yet to show me the distance the Russian army marched was 300 KM. I said it didn't reach its destination whereas the second campaign didn't have enough food after reaching it and hence both failed in their objective. These are facts. The distance of 210 KM was between a Russian fortress to Perekop. You have yet to show me where an army marched out before that or the time it required. Furthermore, I did not count any steppe territory in my calculation of Qing campaigns, I only counted ones where the Qing had no forward bases at the time of the campaign. In the Qianlong campaign of 1755, I counted the Qing army as marching only from Uliatsutai and Hami, both of which are either on steppe or desert territory. The 132,000 into five route was taken from Davies as a planned invasion, I already changed in my later post in regard to what the Russians actually fielded. Speaking of lying, maybe you should look at yourself when you still deny that the Qing can camapign in winter or that you've misinterpreted Perdue when you claimed that. And you wonder why I considered your hypocrisy pathetic. Im not wrong about Napoleon, because he did campaign in winter, but do you admit you are wrong about Germany? Do you imply that Napoleon or the Nazi cannot campaign winter in any situation, period? You said the Qing can't campaign in winter, and completely ignored the context, that was the point. Also you are the one who is obsessed about foreign territory, my argument was merely a response to your obsession. Yes, and he wonders why I get harsh on his responses; he is the only one who is confused at Perdue's arguments and he is blaming me for being unclear; the fundamental problem I now discovered after the past few posts he made, is that he doesn't understand how forced contribution works or how prevalent it was in European warfare at the time. This is clearly reflected from the multiple responses he made, citing several sources where European armies used contributions which in fact outright supports Perdue's claim that forced contribution at below market price is a huge part of European logistics. He thinks he knows more basics than Perdue and assumes the later doesn't have common sense and isn't comparing parallel things and then insist on saying the Qing army had to rely on pillages in places outside of its boundary too yet couldn't provide a single instance just where they did that (despite Perdue already making it clear that the Qing army didn't extract local resources by force; he just didn't spell it out for him that "the Qing army didn't pillage in Xinjiang" but given the context of the article, that much is clear and you caught it as well). My main criticism is that Europeans did not have such vast areas of barren lands to campaign in so they never needed to develop nor had the chance to demonstrate such capacity as the Qing in this same historical period- the colonies come closest but due to naval supply being much cheaper is not a fair comparison. I'm not sure what the criticism is directed towards. Again, all warfare is conditioned on strategic needs; that doesn't mean we can't compare them. Also, glancing at the size of the Russian Empire itself is misleading. Much of the so called Siberian "conquest" is like European colonization of the New World; huge swaths of territory was not even settled or effectively governed and was merely claimed by the Russians because they explored it and no one was challenging that claim. Like the Europeans in the new world, they mostly faced less mobile bands of sparsely populated people initially (until the Americans faced the mid-west Indians) and simply overwhelming them with guns. The actual nomadic steppe territory Russia directly controlled was also very small prior to the end of the 18th century. 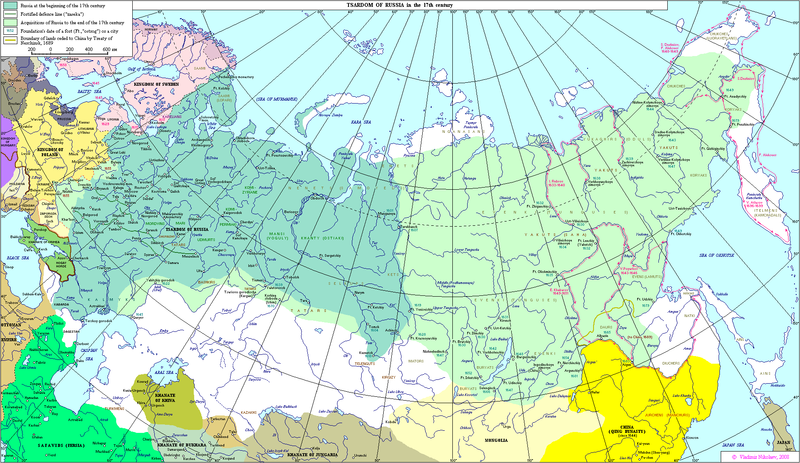 None of the nomadic tribes Russia conquered even had state structure (or had a population in the hundreds of thousand) and at no point prior to the late 18th century did the Russians successfully invaded or controlled a large nomadic polity. The Crimean Tartars exacted "tribute" from the Russians until the late 17th century and wasn't incorporated into the Russian Empire until the 1770s, the Nogai and later Kalmyks moved into the eastern Crimean steppe in the 17th century without any Russian resistance. They merely paid nominal allegiance to the Tzar. The Zunghars successfully raided Russian towns with no retribution. Even the small population of Buriats was largely autonomous before Sporansky's reforms in the early 19th century. The Qing on the other hand was facing the largest and most powerful nomadic polity on earth in the Zunghars and conquered them. By Qianlong's time, the Qing controlled all the nomadic tribes of Mongolia and Zungharia (over a million total with an actual state structure and a large army) with a forcible hand (dividing them at will). By the 18th century, even the internal Mongolian legal system was coming under the control of the Li Fanyuan, even murder cases between common Mongols had to be examined by the Qing court and the emperor. Obviously the private granaries were often inadequate for the job and that's why the Qing and every large dynasty had state granaries. Not burdening the local population is one such area where private granaries was inadequate in and that was part of Perdue's argument. You are utterly confused about some fundamental things. The funding used to build the summer palace is not from the funding for the navy. They are separate projects. It's not like European states didn't built extravagant palaces. The Versaille is just one such an example. Furthermore the late Qing is not the early Qing, since the former already lost a considerable amount of centralized power. I never said the average soldier will speak Mongolian or Tibetan. So another one of your strawman arguments. Most of Perdue's study pertains to Chinese provinces. Furthermore, what is the conflict between buying local products and having a regulator doing that job? Nothing. Provide evidence that there are mutinies on these campaigns, yes the actual evidence. You made the claim, you prove it. I certainly have. If you think court marshaling and punishments pertains to even a noticeable amount of soldiers which might affect the outcome of the war, you've probably wasted your time in the military. Individual soldiers who breaks regulations does not represent the entire army's discipline. Chinese armies campaigning against Mongolia also rarely used Oxens. It depends on the location and circumstances. I would like to see sources showing the number of oxens to horses in both the American army and in ancient Chinese armies if you want to claim they are fundamentally different. Irrelevant whether its cheaper or cheap, the point was to refute your claim that there are more horses in Europe than China. There are railroads and steamships by the 19th century, and the Qing also lost lots of centralized power after the Taiping, so what exactly is your point by bringing in an impertinent period? The Qing lost to the British and Japanese primarily because it had inferior equipment. Are you really going to use this to reflect 18th century logistical capabilities? I already gave you a map of the marching route in post 57 if you bothered to read. The army on the right was the one from Beijing and it did a little garrison hopping as well. My point was to demonstrate that the horses marched well over 10 miles a day, and I've already shown that even if the marching route was in fact a straight line. What is an "impertinent period"? An era of time used to try and compare a different era that had different technologies and organizations. Probably he meant not 'pertaining' too the period. Impertinent does sound quite funny though. "It was just so rude to bring in this comparison." Yes, and he wonders why I get harsh on his responses; he is the only one who is confused at Perdue's arguments and he is blaming me for being unclear; the fundamental problem I now discovered after the past few posts he made, is that he doesn't understand how forced contribution works or how prevalent it was in European warfare at the time. Sure, a forced contribution was an improvement upon direct pillaging as a lip service to the rule of law and the recognition that totally devastating lands an army wanted to conquer was probably bad idea. However many wars the idea of conquest was not really central as national identities and borders were fairly established and scorched earth or harsh confiscations or direct pillage was still relatively common even during Napoleonic wars and the U.S. war between the States. The criticism was that saying Europeans had not the capability to supply a relatively modest army is different than saying Europeans did not demonstrate this ability because it wasn't necessary. Even Qing only needed to demonstrate this ability in one campaign and it was the second try when the first campaign floundered a bit due to supply issues. Finally, I am not sure if it is a an accurate statement of Duzungar Khanate as the "largest and most powerful nomadic polity on earth" without qualifying it as 'at that time' because Qing themselves where the descendants of Jurchen and battled the Ming who were descendants of the Mongols sort of... really so much time had passed the the culture changed along with population sizes, technology, and relative power it was a different era.